Effective Treatment Planning: Cart Before The Horse? There's no denying that substance abuse treatment “success rates” can be alarmingly poor. It is an all-too-common scenario to see a client go through residential treatment for a month or two, and be back using within a few weeks. Compounding this tragedy is the fact that it is not uncommon for families to spend literally tens of thousands of dollars—out of their own pockets—on care for their loved one, only to have everything blow up before the ink is barely dry on the discharge papers. Getting clear about some of the reasons that contribute to poor treatment outcomes is a matter of vital importance, and I have found that The Stages Of Change Model (SCM) provides one of the most effective explanations for how and why this occurs. Accordingly, it also offers a remarkably logical solution for achieving treatment success. Pre-contemplation: Denial that a problem exists. Contemplation: Begin to consider whether or not substance use is a problem. Preparation: Develop a plan to overcome the problem. Action: New behaviors to implement the plan. Maintenance: Symptom-free over a consistent period of time. One important principle of SCM theory is that YOU CAN'T SKIP STAGES. 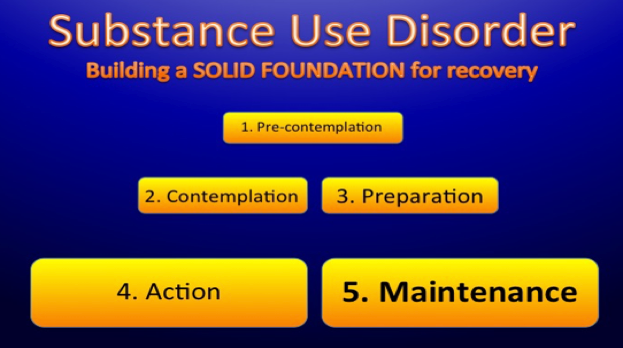 I believe that a majority of relapse can be directly attributed to allowing clients to move on without having satisfied previous stages—primarily the Contemplation Stage and/or the Preparation Stage. In the case of the client who reverts to denial that his or her chemical use is a problem, it could be assumed that contemplation efforts were not satisfactory. In the case of the client who withdraws from the treatment process before completing the recommended plan—which is perhaps the leading reason for treatment failure—it could be assumed that they did not satisfactorily complete the Preparation Stage, i.e. they didn't get “the plan.” It's that simple. In many cases, a client may experience negative consequences prior to treatment and become quite remorseful about his or her chemical use, which leads to the realization of “I have a problem and I need to do something about it.” So they check into rehab. That's their contemplation and preparation. 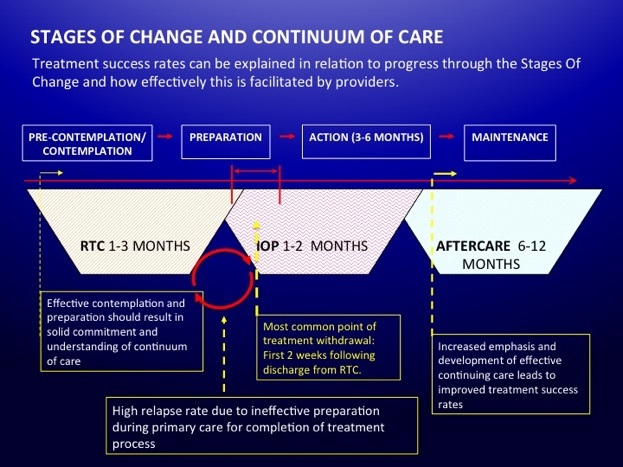 If the staff at the rehab doesn't put on the brakes and say, “OK, we're glad you recognize your drug use is a problem, but we're going to take a closer look at exactly what that means”, they are unwittingly setting the client up to “skip stages”, and the result is a less than solid foundation for recovery. To the contrary, effective Contemplation establishes greater commitment to the fact that “my chemical use is indeed a problem”, which in turn leads to increased motivation for adhering to the plan: The client becomes rock solid in his or her understanding of how important it is to “do this right”, and is clear as to what “doing this right” entails. Unfortunately, this opportunity for increased motivation can be lost by prematurely jumping ahead to the Action Stage. The cart is placed before the horse, and sooner or later that horse is going to crash into the cart and make a big mess. This is what I end up seeing a lot of in my work providing aftercare services for adolescent and young adult treatment clients. While “checking into rehab” would definitely be considered part of the “plan” for overcoming a drug problem, there's more to it than that. Lifestyle changes, ongoing social support (12-Step recovery, for example), and effective continuum of care all fall under the category of preparation, as these are things the client must recognize and embrace as vital to implementing a successful plan for overcoming a drug problem. While the majority of treatment programs teach all of this, many clients discharge from residential care with insufficient understanding of, or commitment to this part of the process. In many cases the message is there—it just needs to be amplified. Another principle of SCM is that the stages are to some extent fluid; they are not set in stone and there is some “back and forth” between them. For example, drug treatment definitely involves a great deal of intensive therapy, and addressing underlying issues that contribute to substance abuse is obviously an important component of the treatment process. Doing therapy to address unresolved issues relative to a drug problem would be appropriately identified as an Action Stage behavior. However, there can be a tendency to jump straight to the Action Stage and lose focus on the contemplation or preparation work, and that's when we run into problems when it comes to discharge planning and ongoing care. Ultimately, we do the client a disservice by not helping them effectively complete the Contemplation and Preparation stages. Too frequently all the good work accomplished in treatment goes out the window before the client gets home because he or she isn't agreeing with the changes or restrictions that need to be implemented. A pretty common statement I hear from adolescents is, “I just signed that home contract to get out of there. I didn't intend on following it!” This would be indicative of unsatisfactory preparation work: they don't understand or agree with the plan. And if they have done solid contemplation work—which should include understanding what it means to have a problem (implications of the disease model)—they would have respect for how serious their problem is, and thus be intent on adhering to the plan. “Can you identify the difference between what you get from 12-Step recovery and what you get from professional care? Clients I work with consistently acknowledge that slowing down and reviewing some of this work—even if they have already admitted their drug use is a problem and have accepted the need for recovery—is indeed valuable and results in increased motivation for working their recovery program. This demonstrates how SCM can be used to avoid cracks in the client's foundation for recovery and eliminate some of the most common causes of relapse. Unfortunately, my observation has been that many programs may say they use Stages of Change in their curriculum, but this doesn't amount to much more than a monthly lecture in the psycho-education rotation. When I present this information in support groups I run for parents of treatment clients, a frequent response is, “Why didn't they teach us this in treatment? It makes so much sense!” Many programs don't include it at all, and a huge opportunity for helping clients understand where they are in the recovery process is missed. Like they say in AA—“There's a reason the steps are in order…” The same holds true with the Stages Of Change Model. Skipping stages leads to putting the cart before the horse, and treatment efforts are compromised. To the contrary, following the process leads to enhanced motivation and a more solid foundation for recovery, which ultimately results in improved treatment outcomes.